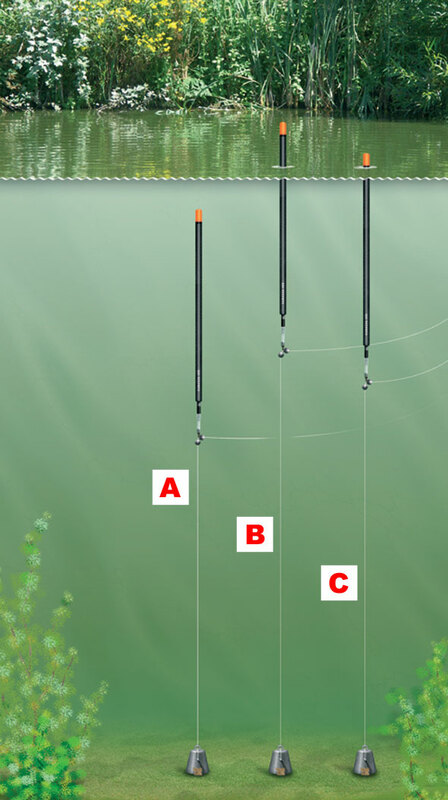 Hold the plummet in one hand and your rod in the other – flex the tip of the rod slightly by pulling the line taught. Open the bail arm of the reel. Swing the rod upwards, let go of the plummet and take your finger off the spool to cast the plummet into the swim. Timing and a smooth motion is crucial, so do it very slowly to begin with to gain practice. Casting the plummet in this fashion minimises the disturbance it causes when it hits the water – but you can cast it overhead just like you would a float if you can’t master this way. Pinch an SSG weight onto your hook (inset). Cast it into the swim in an overhead fashion. As long as the SSG is enough to sink your float it will take it out of sight if you are too shallow. When you can only see the fluorescent part of the float, it is set at a dead depth. A. This shows you are too shallow. B. This shows you are slightly too deep. C. This shows you are just on the bottom.